The sky is pink and blue. The last sun has faded from the Rad Cam and from the tower of St Mary's. I'm sitting at my desk, reading about King Æthelstan. And all across the city, bells are ringing. For Faith's soft light is darkness to the world. A cherub in Lincoln college library, which is housed in a converted 18th-century church on the High St.
Frederick William Faber, author of so many memorable hymns, also wrote several poems about Oxford - a fact I learned as long ago as yesterday, and now intend to share with you. They were included in his 1840 collection The Cherwell Water-Lily and Other Poems; this one is the first of a series of four sonnets. The holy Church more nigh, a thing to fear. Faith, prayer, and love, the spirit of a child. The photograph is of the chapel of Balliol College, where Faber was an undergraduate for a time. 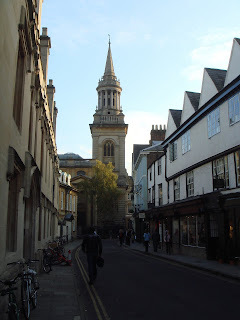 I've been sadly neglectful of this blog's title-city - I even posted a poem by a Cambridge man! - but I hope to remedy that now it's nearly May. There are a lot of poems about Oxford in May. This is not one of them, though. Nearby Littlebourne has a beautiful village green and by comparison the church (which is surrounded by modern houses) is... not so beautiful. It's named for St Vincent of Saragossa, though, which is unusual, and it has a recovered medieval wall-painting. The painting depicts St Christopher, to whom pilgrims would pray before crossing the River Stour on their way to Canterbury. You can see a boat clearly, and perhaps the larger figure is St Christopher carrying Christ on his shoulders? There's something architectural going on in the rest of the picture, and possibly some other more indistinct boats. Poor Chaucer, always to be remembered as a fat man on a horse. The Ellesmere manuscript has a lot to answer for. It was raining the day I went to Patrixbourne. As I've mentioned before, I'm a fan of rain (though not a fan on facebook, because that's just weird). It happened to be a good condition in which to see Patrixbourne, too, because the 'bourne' of the name refers to a stream - the Nailbourne, in fact, the same as flows through Bishopsbourne and Bekesbourne, nearby. It's a winterbourne stream (a word which always makes me think of Thomas Hardy's wonderfully-named Giles Winterborne in The Woodlanders), but a very wet day provided an appropriately damp atmosphere. And this is the south door. Please forgive the smudge of rain on the lens! This chap has a moustache, I think! Oh, those Normans. So whimsical. In the picture below you can just about make out Christ enthroned, surrounded by angels and griffins and such. And some sixteenth-century Swiss glass installed by a Victorian patron of the church, most of it unabashedly secular - like this depiction of Pyramus and Thisbe! You can't quite blame the rain for that one. But a lovely place, nonetheless. I spent part of the Easter vacation seeking out medieval joys among the churches of the Elham valley. The week after Easter is the best time to visit churches, in my opinion, because they always smell of lilies. It's fifteenth-century, alabaster, and both the side panels shows scenes from the life of St Thomas Becket. ...and on the right, Becket's murder. Not many such pieces survive (I should say, not enough!) because so much was destroyed at the Reformation, but this escaped somehow. John the Baptist, obviously enough, with an inappropriately cute little lamb. Apparently Merton College was a benefactor, or something. Rupert Brooke died on this day in 1915. Tomorrow is St George's Day. There are alternative claimants for the position of patron saint of England, and with my general preference for Anglo-Saxon saints, I have to admit I would rather see Edmund of East Anglia or Edward the Confessor as my country's patron; they both have prior claim, they were both really rather wonderful, and they definitely existed, too. Their only disadvantage is that their feastdays are in October and November, rather than sunny April. However, St George is what we have. He took a cup filled with death-bearing drink and cried out to the black devils, and to the foremost devils, and to the powerful ones, and in their name he enchanted the terrible drink and gave it to the Lord's holy one to drink; but the devillish liquid did not harm him in the least. Ælfric really gives those lines the sound of an incantation; it would be interesting to compare them to Old English charms. Is there meant to be a distinction between the black/foremost/powerful devils, or is it merely poetic variation? Either way, it has a resounding rhetorical flourish, and it's not like Ælfric to give the devil the best tunes. The sorceror ends up converting to Christianity, by the way. (Um, not Richard II, obviously). I like to believe that every word of a tribute like this one is true - because someone wanted it to be true, at least, and that means something. Just because a description is expressed in language which is resonant of its time, just because we might choose different words to praise a well-loved man, doesn't mean that such a memorial is not genuinely felt. "At a time when hospitality and simplicity of manners were giving way to fashion and refinement..." The opposition between 'hospitality' and 'fashion' is interesting. The contrast between 'simplicity' vs. 'refinement' is obvious enough, but that hospitality should be considered an old-fashioned, dying virtue strikes me as interesting. "Others may have moved in a higher sphere, but no man ever contributed more to the advantage, comfort and happiness of the circle around him". Who wouldn't want such a lovely tribute? The spelling and the lack of commas are also delightful. 'Experiened' must be a stone-carving example of eye-skip, I assume, caused by the similar shapes of 'c', 'e' and 'd' so close together? Going back even further in time, this memorial to a daughter of a Honywood tells us a lot about family life in the seventeenth century, something about an ideal of womanhood ("in all hir actions grave and provident..."), and even a little about Early Modern spelling: "in memory of home"is particularly interesting. But apart from all that, of course, there was a real woman and children and a loving husband, and without this we might not know... I think these things deserve to be read. The pictures were all taken on Easter Monday at Mount Ephraim Gardens in Kent. They're not all cherry trees but they are, like everything else in England this month, things in bloom. I love churches. Churches of all kinds, really, but especially little village churches which no one would think to visit, which have no special architectural or historical distinction in the grand sense. The closer you look, the more history you find, and the more it begins to seem important. Every stone speaks the soul of the place where it has stood for centuries, and yet there are always similarities and echoes of other places and other times; each church is individual, local, and at the same time belongs to everywhere. There's probably a poem which expresses all that rather better, but I don't have one to hand at the moment. Instead, I have photographs. These are the fruits of a recent visit to the church of St James the Great in Elmsted, Kent. It's on the North Downs, between Canterbury and Folkestone. What are the joys of pretty churches? So much for the outside. Inside? The church is full of memorials to the Honywood family. The window below is in memory of Arthur Honywood, who died in 1880, aged 19, in Afghanistan while bearing the Queen's colours. The plaque underneath the window records that "When already badly wounded, he held the colours above his head and called on his men to rally with the words 'What shall we do to save these?'. The next moment the fatal shot came." It would be better if the tree had, like, apples on it or something, or there were some deer around, but never mind.